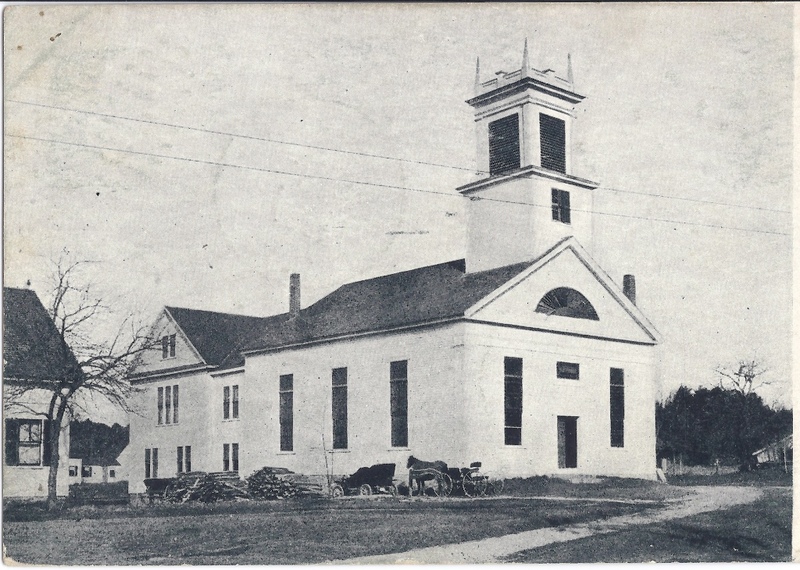 The First Baptist Church of Hudson was organized in 1805 at the home of Thomas Senter on at what is now the Old Derry Road near the Londonderry Line. For the first 37 years services were held in members’ homes or at the North Meeting House located just east of the Town House. The sanctuary of this church at the corner of Central and Greeley Streets was constructed in 1842. In 1888 a short alcove was added to house the new organ; then, in 1897 the large vestry was added. This photo was probably taken at the time of the centennial celebration of the church in 1905. Over these years the exterior of the building has not changed significantly except for replacing the original steeple which was completed in 2007. To the left of the church we see part of the Greeley/Wentworth home, now the church parsonage. The stacks of wood seen here were used to heat the building. The dirt roadway in front of the church is either Central Street or a short cut from Central Street to Greeley Street. Photo from the collection of the Hudson Historical Society. By Ruth M Parker in Center on January 30, 2015 .